Other research has shown that these babies have a more annoying quality to their cry, are more clingy during the day, and take longer to become independent as children. This data is consistent with what we know about painful procedures like circumcision. Cortisol levels rise and permanent neurological damage can and does occur. As a father of two, I can say without hesitation that babies do not cry for the heck of it. There is always a reason, and it is the only communication tool they have to vocalize distress. Thank you for keeping this information in the public eye! Finally there seems to be some data coming in regarding letting babies cry. Maybe the American gov't will take heed and provide some social assistance for mothers/fathers who would like to stay home with their newborns. No one is better equipped to keep a baby safe, secure comfortable than their mommy or daddy. Not some strange daycare provider that baby doesn't know. They should at least provide the option of a year of maternity/parental unemployment benefits similar to Canada's. That may just help to begin to solve some of the serious problems with American youth. Babies should have the RIGHT to have their mommy or daddy home with them for more than a piddly 6 weeks! It makes for a better adjusted and more secure growing child. It also makes for a much better bonded parent. WAKE UP AMERICA, BABIES NEED THEIR PARENTS RIGHT NOW TO GROW UP PROPERLY, when is that going to sink in as a critical issue???? Is there an age limit to this information? Like it is detrimental up until 6 months? It's just that I have relatives that tell me I should let my daughter cry to sleep because she is just crying for my attention (she's 11 months). It hurts me to hear her cry, with the exception of naughty behaviour. I would appreciate finding out when or if this has a time limit. Thank you! Honestly, it seems like they are stuck in the way we used to parent our children. We were told to let them cry to build independence, but honestly, what baby could ever be independent? They count on you for everything and if you ignore their cries you're only increasing the risk of further issues. According to Erikson trust vs mistrust is an important step. As much as he believed as a behavioralist in this independence you can't risk gaining your child's trust. I don't think their is an age limit to being left alone to cry. Especially when a child doens't understand why they are alone and no one is answering their cries for help. Just think of it terms of yourself. Imagine being left alone to cry or call out for help and the person you trust most doesn't come or ignores your calls. And worst of all, you can't get out of your bed to get to the door to look for help. I imiagine there is no limit to feeling abandoned when you can't understand why you aren't being answered when you call for help, it is not limited to an age. Blue Rose - 11 months seems awfully young to let a child cry. You're really going to have to think this through and do what YOU think is best - after all, your relatives will not reap consequences of your parenting choices. You and your child(ren) will. My son is almost 3 years old. He may protest a bit at bedtime. By protesting I mean short-lived crying as a result of having to go to bed. Given his age I'm okay with that. But if he is sobbing, sad, scared, etc...I will not leave him to cry alone in a room. I would personally feel disrespectful and unkind leaving him in an upset state like that. I do not believe that an 11 month old is crying for attention. I believe an 11 month cries because she NEEDS (not wants, but needs) the comfort and security that mommy offers. That's my two cents. I'm not trying to offend - just respond. I don't really think there is an age limit to CIO. Even adults experience an increased adrenaline response in what they perceive to be scary or terrifying situations. I can tell you I also have an 11 month who has been a handful lately. He's teething really badly and is crying in pain as all these teeth are popping out at once. Just because a well meaning relative doesn't see an outward need for your baby's cry doesn't mean they don't have a reason for crying. Hang in there, Mama, as these last days of babyhood are gone in a flash. Stick to you instincts and respond to your child the way YOU see fit. If there was an age limit, it would definitely not be 6 months. I don't think there is ever an appropriate time to leave an child, especially an infant, to cry alone. My son is 15 months, and I would never, ever, leave him to cry alone. Even if I can't/won't fix everything for him, I will be there to comfort him when he is upset. Though your relatives may mean well, the belief that you should leave a infant/child to cry alone is incredibly damaging and outdated. Think about it in "cave man" terms. Biologically, we are still "cave men", and babies especially, operate almost completely on those "cave man" insticts. They can't reason with themselves and say "well, I'm in my nice soft crib and mom is in the other room, so it's safe to fall asleep alone". If a cave mama left her baby to cry alone in the dark at night, that baby would surly get eaten by some wild animal. So that is what a baby's instincts are telling her while she cries and cries alone in a dark room. "MY MOTHER HAS ABANDONED ME, I'M GOING TO DIE!!" Trust your instincts mama! If it doesn't feel right, it probably isn't right. There is a big difference between "spoiling" a child by giving them everything they want and meeting their emotional needs so that they grow into healthy, balanced adults. I definitely feel that a baby feeling a sense of safety falling asleep goes in the "needs" category. Unless they are old enough to be verbally reasoned with, unless they are old enough to concretely understand that you're just in the other room and that they are safe, they cannot possibly understand why you are leaving them alone with their terror. Bravo to you for hearing your instincts and asking questions. This blog has ample, fantastic advice about healthy parenting practices, and I encourage you to read more. If their mother/father/aunt/themselves(pick someone they really care about even you but then I'd say not nursing home but say in an accident) were in a nursing home and couldn't get out of bed on his own and had trouble communicating and the nursing staff put him in bed at 9pm, tucked them in and turned out the light. Then no matter what he said, no matter how hard he cried they wouldn't come back until 9am the next day. It doesn't matter if he is thirsty, needs to go bathroom, or gets sick. Would that be acceptable, or would that be abuse? Would you leave him there if you had a choice? Ask them how they feel after they've been crying? Is it pleasant? Conducive to restful sleep? You know when she needs you and when she doesn't (or maybe when she is crying but can work it out herself_. And the need for human contact and comfort is a need, its a need for adults but its even more of a need for babies -without it some will simply stop thriving. Normal, healthy babies self-wean around 3-5 years old*, remarkably that's when many stop night waking. Meeting a child's needs is never detrimental, no matter how old they are. Also meeting a child's wants isn't detrimental, kids that are "given everything" aren't spoiled because everything; they're spoiled because their need for a parent isn't filled -when they are given things INSTEAD of parenting. "Spoiling happens when a child is put on the shelf, left alone, forgotten about--the way that food spoils. There was no scientific basis for this spoiling theory, just unwarranted fears and opinions. We would like to put the spoiling theory on the shelf – to spoil forever.? *Actually 2-7, but the majority around 3-5 particularly in this culture where nursing isn't cherished as it is in say Mongolia. Blue Rose - I would say no, there is really not a set age limit. That said, it can be harmful to any child who is left to cry without knowing why they are left to cry. A child at 11 months of age cannot be "spoiled" and chances are good that your daughter is probably lonely and in need of attention. I like the previous poster's analogy comparing it to someone who is left in a nursing facility or elderly care facility. It's not a BAD thing that your child wants attention, no matter what others are going to tell you. Think of it this way: do you miss your husband if he is away on a business trip and wish he was there beside you? But you understand why he is away. It's the same for a little one, but much worse because at that age, they have no understanding of why mommy or daddy cannot be there to comfort them. If they cannot meet the needs themselves, then they probably should not be left to cry. My almost 2-year-old will fall asleep by herself, but many nights she wants mommy beside her, or at a bare minimum, in the same room. I am fine with that; it's not like she will need to be comforted at night forever. These early years are precious. I believe it is far easier to give her the love and attention she needs now and enjoy those cuddles than have both of us unable to sleep, and possibly have an aggressive or dependent child later in life. I can only say from experience with my own daughter that answering her cries every time has made her a secure child. She doesn't need me for everything, in fact she is rather independent, and secure in knowing that I will be there when she really needs me, every time, even in the night hours. Every child is different and has different needs to be met. Some children are needier, but that doesn't make them any less worthy of having those needs met. We don't stop becoming parents at night and if there is a genuine need, it is far better to be there for a child than let them feel helpless that no one is coming for them. Babies have emotional needs just like adults. There will be a time, if your follow your daughter's cues, when you will know the tone of her cries and understand why she is crying, or what it is that she needs. Follow your instincts rather than what everyone else tells you to do - you are the mom and you know your child better than anyone else. If you receive criticism, be sure to let those who criticize know that they are welcome to have their turn with their own children. You're the parent and you know what's best since you are around your child all the time. 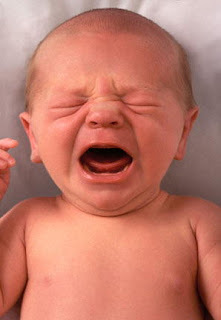 Babies cry because they have a need for something, whether it be food, diaper change, or just wanting love and attention. Mainstream society (and our parents) tend to believe what they were told by doctors years ago - leave your child to cry or he/she will become too dependent. That is simply outdated and harmful information. Go with your instincts and what feels right. If you don't feel comfortable leaving your child to cry, it's probably for good reason. Children need love and encouragement, especially in those first few years. Don't let anyone else make you second-guess your mommy instincts. When 'training' my three children about bedtime, I realy discovered a free, love learned lesson taught by mother nature: all persons desire to sleep when they are tired. Furthermore, most of us like to keep a regular day to day schedule and do so at the same time daily. Bed time for all of my three starts with snack, bathtime, drinks of water, potty time, stories in bed, nursing and snuggling. Very simple, but affords everyone time to relax, spend time with mommy and daddy and feel totally safe, satiated and loved up. We have not had any crying it out or bedtime distress. There are even days when a super tired kid (now ages 5, 3 & 2) will simply ask to go to bed. I feel it helps that we co-sleep and extended nurse. Although presently, none of our kids starts their sleep in our bed anymore. I feel that letting babies cry without a parental response teaches callous and cold inter-personal coping skills. Both my heart and my brain want to give my children love, support and help them to grow into confident well adjusted adults. Nothing about crying alone as an infant or child seems like a good manner in which to help them grow up to be compassionate & well balanced people. We have two, aged 4 and almost 3, still in our bed, or attached to our bed by little beds. It is harmony and happiness, though my heart does go out to those mothers who are feeling violent thoughts toward their children due to be exhausted and sleep-deprived. The CIO is a cry for help from mothers who don't have a good support system. Just great comments all around. i have nothing to add to the wisdom before me. Makes me proud to be parenting in the 21st century! ak You might try putting up one of those little window shades so your baby doesn't see the world rushing by. My feeling is that this visual sensation gives babies a feeling like falling, especially when the infant car seat is put in facing the back. AK - although I do not typically advocate for television or videos for children under the age of 2-3 years old, when it comes to car time that they *must* endure without a backseat parent to interact with them, sometimes the lesser 'evil' is what we have to go with - in this case, videos over emotional pain and stress hormone spikes. because they can turn/twist/lock/be put in place or held) and a few age-appropriate videos that your child enjoys (Baby Einstein, Baby Signs, etc.) leave the player plugged in (charged up) and only use it during car time. This can turn horrific rides into enjoyable ones and cut down on those negative hormone washes, as well as making the trip more comfortable (and safe!) for the driver. Are the affects the same for children who cry a lot, but have their parents holding/cuddling them while they cry. My son has allergies and reflux and spent the first few months of his life crying most of the time. Now he is fussy a lot, but he only really hollers at night. His allergies and all medical issues are under control. We aren't sure why he cries. He sleeps with us (we sidecar his crib) and some nights he will scream for a long time regardless of what we do. We NEVER leave him alone to cry on his own, but all of this research on crying and it's affects on the brain have me concerned - I have no clue what to do about it. Laurettabear I think the damaging effects would be lessened by being held close and comforted. I would suggest taking him to see a chiropractor that is trained in infant adjustments and also a naturopath, they may be able to help and/or shed some light on the resons for the constant crying. I really hope things get better for you and your son soon. Lauretta- I have read that there ARE major differences in the babies whose parents are holding them while they cry. I'll do my best to find 1 & post it here. You are soothing your baby even if they can not stop crying. You also are reinforcing the paradigm in their brain that when they are in pain or need help someone will be there. I think of it as when I've been hurt & cried as an adult & someone has been there to hold my hand that has greatly improved my emotional state even if it can't make the pain go away. I have sadly seen the effects on an older child who was left to cry it out. My former step-son was left for great periods of time to cry from pretty much the beginning of his life, from what i was told, and he has a lot of the issues the article talked about. Do not leave a baby ever to cry by themselves. There is always a reason for their cries. We had our children sleeping in their own beds from the time they were very small. I never left them to 'cry it out' however. I would nurse and rock the baby to sleep, then put him/her (twins) into their beds. We had monitors to hear them if they started up again. WE (my husband and I) would go in to soothe the baby and rub his/her back or tummy and sing or croon love songs to them until they relaxed and fell back asleep. All three of them slept through the night by the time they were 9 months old. Maybe we were just lucky. I don't know. I can tell you that none of them have emotional issues, and grew up into wonderfully healthy happy children and adults. My grandchildren are being raised the same way and are well adjusted and happy wee birdlings. I do believe that there is always a reason why a child cries. It is important that we as parents and grandparents pay attention to those tears. I have 2 children. Jp is 2 1/2. Jw is 12 months. I had them both sleeping on there own since birth. but I never let them CIO. Jp slept thru the night since 4 months, Jw did since his first week he went 10 hours. from month 4-8 he started waking up anywhere from 1-5 times a night. I offered him to nurse everytime, but by 6 months, he was not interested anymore in nursing overnight so I would just cuddle him till he calmed down and then layer him down again to sleep. Both my boys are very much 'mommies boys' and if I must say so, they are very happy healthy boys. I'm currently 30 weeks pregnant with my next one and some days its very exhausting when they both want only mommy at the same time, but we survive taking it one day at a time. One of my son's 10 month old twin boys cries excessively when his father leaves the room and does not stop crying until his father returns. My son is their primary caretaker and the excessive crying is extremely stressful for both him and the boy. My son carries him around when possible but when put down, child screams crying and looks around anxiously until his return. It seems to be related to separation anxiety but after 10 months you would think it would calm down. The twins were two months premature so I am not sure if this would matter.